Psittacosaurus is seemingly one of the most successful dinosaurs ever, with a temporal range of nearly 30 million years with hundreds of known specimens assigned to nine valid species (a record among non-avian dinosaur genera). It is in fact so ubiquitous that it is sometimes used as an index fossil in Early Cretaceous central Asia deposits. I think that the 12 species are different in head size and color. Body size, too. 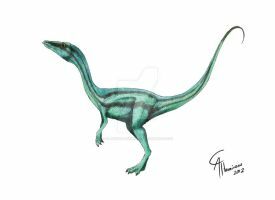 A lot of 'ttacos have bigger and smaller bodies than P. mongoliensis. One species ("P. sibiricus") is even different enough to warrant being placed in its own genus (the head shape is really weird, for starters; it also has an additional two horns on its face that no other species of Psittacosaurus has). The black and white should be tan. This is P. mongoliensis. I believe the species you're looking for is P. houi (or "P. lujiatunensis", but P. houi has priority). In any case, this was made before the study on the colours specimen was published. Yet another really interesting color pattern! Where do you get your inspiration from? I know a lot of people view these creatures as basically defenseless prey, but I've got to say that beak on the end of their snout would prove quite formidable. I've got a pair of conures at home that weight about 3 ounces and aren't much bigger than a robin, but they pack quite the hurt into a bite from their tiny beaks. I certainly wouldn't want to be on the receiving end of a chomp from a 60 pound, 6.5 foot parrot! Any predator hoping to make a meal of one should keep its distance from the front end of this creature. you know, i'm not sure where i go the pattern idea from, it's been so long. i may have just flat out made it up. and i agree on your assertion that psittacosaurus would have been dangerous. i like to imagine a wild boar--sure it's a plant eater, but it's powerful and has a nasty bite. Makes me think of the hypothesis that the Dueling Dinosaurs wasn't actually predation by the Velociraptor and was actually the dromaeosaur defending itself from the Protoceratops. Did any of those 9 species have warthog-like bumbs on its head? I saw a reconstruction that said that was scientifically correct, is that true? that would be p.sibiricus. it's an unusual looking fellow.